Summer is here! That means BBQs, vacations, and day trips... which mean lots of delicious food! We've got tips and tricks to help you enjoy these sunny months -- eating great food without gaining any weight. Ready for some fun? 1. Unless you're heading to a cookout, eat before you leave home. You'll save cash and calories -- chances are, the food at home will be less expensive and better for you than anything you'll find at your destination. Going to an amusement park or baseball game? First have a protein-packed meal! Pssst... Click on the previous links for eating advice once there. 2. Be prepared. Pack emergency snacks that can stand the heat, like 100-calorie packs of nuts, jerky, and snack bars without melty layers. Click here, here, and here for great picks. Non-food must-haves: sunscreen and cute sunglasses! 3. Stay hydrated. It's hot out there! And did you know dehydration can trick your body into thinking its hungry, when what you really need is some good old-fashioned agua? Remember to keep the water flowing wherever you go, and carry around a refillable water bottle when possible. Bored with plain H2O? Click for tips. 5. Check out all your options before you chew. Strolling along the boardwalk? Don't stop at the first giant-pretzel vendor you see. At a BBQ? Peruse all the food items being offered before filling up your plate. This will help you find the most diet-friendly options and determine what might be worth splurging on. 6. Contribute to the cookout! If you bring guilt-free food, that's one less item on the table with a big caloric question mark over it. But we're not suggesting you roll up with a bag of celery -- check out the recipe links below for ideas everyone will love. 7. Get a cooler. If you're going on a road trip, you'll be able to cart along healthy drive-time snacks, like cut veggies and light yogurt. If you're going to the beach for the day, you won't be stuck buying cold drinks every hour. And if you're camping or picnicking, you'll be a hero to the whole group! 8. Have fun! Hey, if you overdo it a bit, it's anything but the end of the world. Shake it off, and get back on track. If you know you'll be indulging a bit more on vacation, prioritize some bonus exercise. Plan when you can, don't stress, and enjoy the summer! Party Snacks: A tub of fresh salsa, a bag of baked tortilla chips, and some assorted cut veggies will do the trick. Need a creamy dipper? Grab a yogurt-based dressing... or make your own in a flash! Protein Picks: Boneless skinless chicken breasts are our go-to grillables, but we also love meatless burgers and low-fat hot dogs. And poultry patties, like the kinds by Jennie-O and Al Fresco, rock like crazy. Sauces & Marinades: Mrs. Dash's Marinades are salt-free, Lawry's are incredible, and we LOVE the stuff by Stubb's! Buns 'n Beyond: It's all about the 100-calorie flat sandwich buns. Or skip the carbs, grab a head of lettuce, and wrap your burgs in veggie leaves! Frozen Treats: You can't go wrong with light ice creams from Dreyer's/Edy's. Frozen Greek yogurts like the stuff from Dannon Oikos are great, as are the nondairy options from So Delicious. For single-serve treats, raid the Skinny Cow section of the freezer case. And don't forget Enlightened The Good-For-You Ice Cream bars! Mega Recipe Roundup! From burgers to sides, we've got all your BBQ recipe needs right here. Ultimate Grilling Guide! Cookout tips, kebab recipes, and the need-to-know info for making foil packs on the grill. All that and more is just a click away! 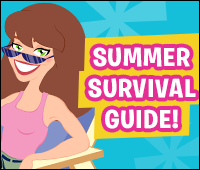 Share all these great summer tips with your pals -- click "Send to a Friend" NOW. This Sunday, June 29th, is National Almond Butter Crunch Day. Sounds like a good time to spread some portion-controlled almond butter onto crunchy Old London Melba Toasts!